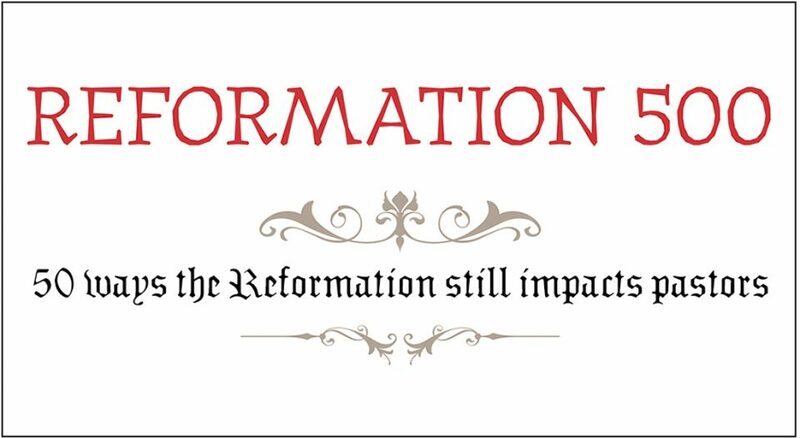 As we commemorate the 500th anniversary of the Reformation, Living Lutheran is exploring 500 of its unique aspects, concluding the series this month with 50 ways the Reformation still impacts pastors. This list is not meant as an all-encompassing compendium of everything essential to the Reformation and its theology, but rather as a glimpse of the variety of ways the movement that Luther sparked in 1517 would influence the history of the world. Pastor, St. Stephen Lutheran Church, Hicksville, N.Y.
Theology for the people. Martin Luther’s theology flowed from the pastoral concerns he had for his people. As a pastor, it’s important that my theological understanding grows from the needs and concerns of my people, my neighbors, my community. Context matters. Luther’s assertion that word and sacrament are what matters when it comes to worship, and the rest is adiaphora (theological nonessentials), is critical to becoming a more just and inclusive church. At St. Stephen, it allows us to continually reform worship, spreading the good news of God’s loving work further and wider. I am so not in charge. As the pastor, I am just one member of the priesthood of all believers. The people of my congregation are always ministering alongside me and teach me every day. Be a sinner and sin boldly … Luther’s frequent reminders of human sinfulness can seem like a downer. But in daily ministry, I see how the belief that we can be perfect and “do it all” leadfaith & s to despair. We can’t do it. Accept it. … but trust more boldly in the grace of God. God never stops speaking love, mercy and grace to us. But it’s when we finally trust that we can fall back on the love of God that the fullness of life overflows into a beautiful, bold, constant outpouring of gratitude. Pastor, Atonement Lutheran Church, Overland Park, Kan.
“And.” Thanks to former Presiding Bishop Mark Hanson for amplifying this most important Lutheran word that accommodates tension and the breadth of truth: Jesus Christ is divine and human; we are saints and sinners gifted with law and gospel. For us, this is true both individually and collectively: it has helped me see systems, families, congregations and church more clearly and completely. Sola scriptura. I am so grateful for and inspired by the reformers’ insistence upon the primacy of the biblical word and Luther’s particular passion for connecting it with people’s daily lives. Theology of the cross. Calling something what it is, while also clinging to hope in the holy, mysterious God hidden in the horrors of human history. This is an essential guard against the temptations of easy answers, platitudes, stereotypes, dismissiveness and despair. “Oh that I could pray the way this dog watches the meat!” This quote from Luther not only resonates with my own distracted prayer life; it also showcases the humor, humanity and earthy, insightful spirituality of Luther—and the blessedness of dogs! Grace. This is the heart, the point of it all. Pastor, Apostles Lutheran Church, Turnersville, N.J. The Spirit of God. I find comfort in Luther’s explanation of the third article of the Apostles’ Creed: “I believe that by my own understanding or strength I cannot believe in Jesus Christ my Lord or come to him.” The Spirit of God gives me, and the whole Christian church, the faith we need in order to follow in the footsteps of our savior. Absolute truth. The Reformation’s biggest lesson for me is that God’s love for humanity is the only absolute and ultimate truth that we can trust. Any other system, person or institution that asks for this absolute trust must be viewed as penultimate and fallible. The democratization of ministry. One of the Reformation’s fundamentals that is still vital to my work is the understanding that all Christians are called at baptism to serve God and neighbor with their gifts, talents and treasures. In other words, the democratization of ministry. Preaching the law and the gospel. The dynamics of law and gospel inform the way in which I write my sermons. When I preach the law, I try to lift up the human condition, and with the gospel, I proclaim God’s assurance of forgiveness to all, thanks to Christ’s death and resurrection. Freedom. The Reformation has taught me that God’s last word for us is always forgiveness, life and salvation. Luther has also taught me that we are free to think, give our opinions, debate and struggle to what we think is God’s will for the sake of creation. “One has to look at the mouth of the people” –Luther. The reformer understood that, in order to reach people with the good news of Christ’s grace and salvation, you have to speak their language—and for that, you have to actually understand their situation. Beyond language, this applies to cultural shifts and means of communication today. “Christians must be taught …” –Luther (repeatedly in the 95 Theses). Luther advocated for the education that leads to critical thinking of all Christians in order to live their calling to the fullest. Christian education today should still be thought-provoking and lead to informed and respectful discourse in the face of difference of opinion. “What does this mean?” –Luther (repeatedly in the Small Catechism). As followers of Christ, we mustn’t pretend we have all the answers, but we are called to have an inquisitive heart and mind. Christian life is about wrestling with God’s word, even and especially in conversation with those who have different backgrounds or understandings of God’s word. “[Give] yourself in service to your neighbor just as you see that Christ has given himself for you –Luther. Grace frees us from the immense burden to somehow redeem ourselves, but we still have the responsibility to extend God’s grace and love to those who need them today (which is everyone). “A Christian is a perfectly free lord of all, subject to none. A Christian is a perfectly dutiful servant of all, subject of all, subject to all” –Luther. Freedom has become a keyword and is often interpreted as a personal freedom to do whatever benefits the individual—and subsequently leads to the limitation or even obliteration of the freedom of the underprivileged. Our Christian freedom is defined by the bounds of God’s law of love for the neighbor and all of creation. Pastor, First English Lutheran Church, Billings, Mont. Showing up. My favorite Luther quote states, “Here I stand, I can do no other, so help me God.” For me, this quote employs those visceral, gut feelings we detect when facing a decision to either give in to the status quo or show up for and speak out in the name of justice, no matter the cost. Baptism. Luther’s take on baptism is the main reason I’m a Lutheran today. Baptism is not a one-time event or a required, eschatological confession. Rather, it is an outward sign of God’s eternal love for us in Christ that has no beginning or end. God’s omnipresence. In a letter to Swiss reformer Huldrych Zwingli on the real presence of Christ in the sacrament, Luther wrote that “God is as present in your cabbage soup as in the sacrament. The difference is that God is hidden in the soup and revealed in the sacrament.” I love this statement, affirming God’s omnipresence in every aspect of our lives. Paradoxy. Luther was paradoxical in his teachings, stating that we are “simultaneously saint and sinner” and both free and subject to none while dutiful and servant to all. These statements remind me of my constant need to self-evaluate and seek forgiveness from God, approaching the font every day to die to self and then rise again as a new creation. Challenging the church. The kinds of reforms Luther demanded from his church also give me the courage to challenge my church. Because the ELCA is a mainly white church, we need to learn to decolonize worship and our theology, and we need to uplift the bodies and voices of people of non-white descent or color. Here I Stand. I was first introduced to the study of Luther 21 years ago by reading Roland Bainton’s seminal book Here I Stand: A Life of Martin Luther. Deus absconditus. Luther’s academic study of Deus absconditus—the idea that God’s mercy in Christ comes sub cruce tecta (covered under a cross); not so much hidden so that it’s not at all visible, but covered under what looks like the opposite (sub contrario objectu meaning “under its contrary opposite”). “The contrary opposite.” The most provocative “contrary opposite” is the cross itself—the completed work of Christ. Transparent dialogue. As an ecumenist, Deus absconditus has guided me in having a transparent dialogue of humankind through common experiences. God being present in our world. My feminist interpretation of Deus absconditus, which I learned from theologian Dorothee Söelle, is that God moves beyond being with those who suffer; God is present in our world, and human suffering battles with us for life. Pastor of worship and education, Messiah Lutheran Church, Wauconda, Ill.
God revealed in the cross. I love Luther’s theses and explanations for the Heidelberg Disputation, and I think about them a lot. They remind me that while I’m tempted to look for God in wisdom and glory, I can only see God revealed in the cross and suffering. Command and promise. In preaching and teaching, I find it continually helpful to look for these direct, intimate, unconditional ways God communicates with us. Word and sacrament. The gifts of word and sacrament create the church and make it visible to the world. The reformers help me stay focused on these gifts. “Passive righteousness.” This phrase of Luther’s doesn’t translate well (the last thing we need to hear is an encouragement to passivity! ), but it helps me remember that God’s work in us is much more effective than any program we design to please God. The Freedom of a Christian. This is the name of a favorite Luther treatise and also an important idea: freedom not as an absence of rules or constraints, but as a freely embraced responsibility for each other. Pastor, Grace Lutheran Church, Chesapeake, Va. The Luther Rose. When I get mired down in the complexity and craziness of life, the Luther Rose is a great reminder of the gospel at its most basic: the pain-causing black cross gives our red hearts life; faith in this truth gives joy, comfort and peace (white); we can glimpse this peace both while on earth (blue) and forever (gold). Luther’s summary of theology is so basic, yet so beautiful. The spreading of ideas. Luther wasn’t the first to suggest reforms for the church, but his ideas spread due to a perfect storm of events, including the invention of the movable type printing press in Europe. Social media is today’s printing press: a new tool that can be used to spread God’s love (or not—depending on how you use it). 95 Theses. Many Lutherans have read, or maybe even memorized, Luther’s Small Catechism, but Luther’s 95 Theses show us what he was resisting in the church of his day. It’s important to be able to separate this Catholic church of the past from the Roman Catholic Church of today as we live ever more fully into ecumenism. We worship God, not Luther. One of the most important parts of being Lutheran today is to remember and to be able to admit that Luther wasn’t perfect. Like us, he is simul justus et peccator (simultaneously justified and sinful). He did a lot to spread God’s good news in this world, but also said and wrote some terrible things, for which the Lutheran church has since apologized. Pastor, St. Mark Lutheran Church, Cape Girardeau, Mo. “We are church. We are Lutheran. We are church together. We are church for the sake of the world.” –Presiding Bishop Elizabeth Eaton (four emphases for understanding church) Years of conversation informs me that the notion “We are Lutheran” often functions at a level of subconscious presupposition. I continue to be inspired whenever I offer historical context to empower a more cognizant sense of what being Lutheran means 500 years after the Reformation. “The histories present powerfully with examples and happenings making them visually so real, as though one were there and saw everything happen that the word had previously conveyed to the ears by mere teaching.” –Luther (Preface to Galeatius Capella’s History) The enthusiastic response among participants in trips to Germany that I have been leading on behalf of the Central States Synod this year reminds me of the power of history to inform us of who we are in the present in light of our past. “Therefore every scribe who has been trained for the kingdom of heaven is like the master of a household who brings out of his treasure what is new and what is old.” –Jesus (Matthew 13:52) In Matthew, Jesus addresses the problem of becoming enmeshed in perspectives on the past to the point of missing the work of God in the present. Likewise, the fact that we continue to identify as Lutheran connects us to a distant past in ways that should continue to inform our identity while emboldening our present ministries as God works through us. “What’s past is prologue.” –William Shakespeare (The Tempest) I remain fascinated by the fact that events that unfolded 500 years ago continue as such an indelible part of our identity as Lutherans. Our past ought to tell us something of who we are in the present even as we recognize that our past is not determinate of our future. “We have lost the Reformation.” –Heinz Schilling (The Protestant Reformation in German History) No credible historian today takes literally the notion that all European reformations began with the blow of Luther’s hammer. I have devoted years to scholarship that seeks to understand the global conditions that created the increasingly complex world that, in turn, stimulated a total reassessment by Europeans of the relationship of humanity to each other, the place of humanity in the cosmos, God’s relationship to humanity and God’s relationship to the natural world. Pastor, Our Saviour’s Atonement Lutheran Church, New York, N.Y.
“God is essentially present in all places, even the tiniest tree leaf.” –Luther (LW 37: 57-58). As I have grown into the ministry, I’ve begun to realize that the defining ethical challenge of my time is climate change. Luther’s understanding of God’s presence in creation made available for us in the sacraments has given me a theological foundation for preaching and teaching creation care. “The true treasure of the church is the Holy Gospel of the glory and grace of God.” –Luther (Thesis 62) In a time when churches are closing, synods are selling property, and people are afraid that the influence of the mainline Protestant denominations has waned to nothing, I need to hear over and over that the real treasure, power and beauty of our faith is not with a building or a bank account, but with the saving message of God’s love for all people. “Every call of Christ leads to death.” –Dietrich Bonhoeffer (Discipleship) I have come to learn that being a Christian means that everything we are is Christ’s. We are his. And the more I live as if I am Christ’s, the freer and more faithful I become. God’s unbreakable promises. In my pastoral care, the Lutheran sacramental understanding of God’s unbreakable promises, made available for us in tangible, objective signs, has helped me more than anything else. The God we seek promises to be found, and God wants us to find God in real things. Christ’s heart is bigger than our grievances. The ecumenical movement of the latter half of the 20th century, which seems to have truly striven to break down barriers and make a broken church whole, helps me realize that Christ’s heart is bigger than our grievances. That movement inspires me to see Christ at work everywhere (even with people I’d rather he leave alone).